And it’s true. Early snows collect in the nooks and crannies of leafless aspen groves in the fall, and residual patches cling to the same spots in the spring. Yet, we are so lucky to have our winter weather patterns: moderate to heavy snowfall, settling deep into the remote mountain crags and crevasses. As it melts, it results in a delicious profusion of wildflowers and the crystal clear waters that rush and meander into our local waterways – “a fountain of youth” that our own flowers and vegetables get to drink from. As fall approaches and the water pulls back, home gardeners adopt the concept of “fall clean, spring gleam.” Simply put, this means emptying our gardens of spent flower stalks and pesky weeds in fall so our gardens are well groomed for spring’s arrival. This practice is not only a healthy garden preparation for spring, but it can also be a meditative closure to our never-long-enough growing season. Why Clean in the Fall? I prefer to clean my beds in the fall for a couple of reasons. First, it helps minimize the potential of harboring weed seeds, plant disease, and pests—all of which can live (warm and protected) in the subnivean quarters of snow, matted leaves, and stalks. Secondly, it makes spring growth easy to spot when perusing beds in that hunched-over-slow-creep-through-the-garden type of walk in hope of seeing something—anything—green sprouting in the flower bed. Come March, April, and even into May, snowfall still graces the valley floor. But to see those first brave perennials push their leaves out from underneath it truly is the most exciting way to witness Mother Nature do her thing. Not every variety of plant (perennials, climbers, or flowering shrub) wants or needs to be cut all the way back in the fall. However, most perennials don’t mind at all. 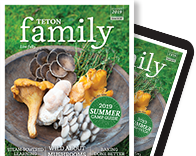 Oriental poppies, columbine, penstemon, and yarrow are such prolific growers and bloomers; removing their plant material down to about two or three inches in height makes a world of difference in spring. Pay close attention to lilacs. They need to be cut back right after their spring bloom, rather than in the fall. If you make the mistake of pruning them this fall, you may cut off their setting flower buds, resulting in little to no flowering in season. So just leave them be. Because, quite frankly, spring just isn’t spring without lilacs! There comes a point toward the end of summer when the mightiest and most dreaded daily task is weeding. This is when I focus my attention on the beds only, because everywhere else broadleaves and grasses invade all other open patches of dirt—overnight, it seems. I have to say that I don’t love the proliferation of, say, dandelions. Still, if I keep the flower heads mowed, the green leaves are at least soft to walk on. And they’re edible, too, so I try to not spray them. Let’s be realistic: If a group of deer cruises through my yard, I’d rather they dine on my collection of dandelions than my roses, my herbs, or my apple tree. What I love most about gardening is the planning and anticipation of seeing my visions come to life the next season. And at the top of that anticipatory prep list lands spring’s first flowers: bulbs. (Of course there are fall-blooming bulbs, as well.) I like to work bulbs, versus annuals, into the empty spaces in my beds. Nothing against annuals—pansies and violas actually tend to be hardy annuals in zones 3 and 4—I just prefer a little more bang for my buck. So I reserve annuals for container gardening only. To plant bulbs, dig out the designated depths (a good rule of thumb is to dig a hole three times the height of the bulb), toss in some bone meal (a natural slow-release fertilizer), place the bulb in root-side-down, top ’er off with dirt and wait, like, six months. When deciding where to place bulbs, keep in mind that they do have an expiration date when they’ll need to be dug up and replanted with a new batch. Since every precious moment you spend gardening results in healthy plants that flower, a little extra help might not be so bad. For this, I call in a fall soil amender or top dressing, like bark and steer manure or compost. Soil pep and other bark-chip material works well here, too. After trimming back summer’s growth, weeding, and planting bulbs, dress each bed with an inch or two of top dressing. What you use depends on what you grow. For instance, I use soil pep in all of my flowerbeds and in tree wells. But for strawberries I’ll top dress with bark and steer manure. Most of these materials are available bagged or in bulk, depending on how much you need. 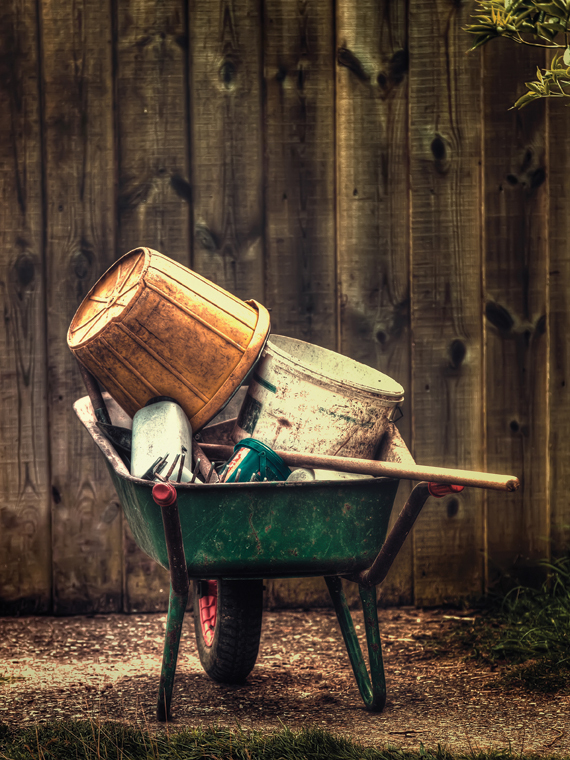 Aside from my gloves, tubs, weeding tool, and shovel, my wheelbarrow is my most treasured tool. Frankly, nothing gets done without it—which includes composting. There is a patch in my backyard where loads of green and woody yard waste live. Old annuals, spent veggie plants, grass, and branches all make great compost. Not welcome here are any plants you cut out of your bed that contain disease (like a powdery mildew) or pests (like aphids) and any noxious weeds. Burn those instead. Grab information online or at your local nursery on specific composting guidelines. But the big “no’s” to leave out are: proteins (including meat, dairy, and bone), oily food or grease, animal waste, and, a big “no” to anything treated with pesticides. Hanging out in my garden makes me calm and relaxed—and it also conjures up creativity. It’s a favorite place to watch the sunrise and the sunset; it’s a cool respite from a hot summer spell; and it’s the perfect place to chill with my family and pets. Putting it all to rest in the fall and knowing that it’s covered and happy under the season’s snowfall makes spring well deserved after enduring the long winter.